This first full-scale history of the development of the American suburb examines how "the good life" in America came to be equated with the a home of one's own surrounded by a grassy yard and located far from the urban workplace. 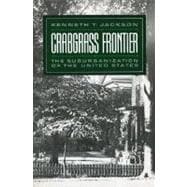 Integrating social history with economic and architecturalanalysis, and taking into account such factors as the availability of cheap land, inexpensive building methods, and rapid transportation, Kenneth Jackson chronicles the phenomenal growth of the American suburb from the middle of the 19th century to the present day. He treats communities in everysection of the U.S. and compares American residential patterns with those of Japan and Europe. In conclusion, Jackson offers a controversial prediction: that the future of residential deconcentration will be very different from its past in both the U.S. and Europe.